Dr Sean S O’Sullivan is a Consultant Neurologist at the Bon Secours Hospital, Cork and has private rooms for outpatient consultations in The Cork Clinic, Western Road, Cork. Dr O’Sullivan completed his undergraduate training at University College Cork, Ireland, having attained an honours degree MB BCh, BAO and BMedSci. He subsequently gained a Certificate of General Professional Training from the Royal College of Physicians of Ireland, before entering neurology specialist training at the same college. He undertook a fellowship at the National Hospital for Neurology and Neurosurgery, Queen Square London and completed his specialist neurology training there and at the Royal London Hospital. He has been on the Neurology Specialist Register of the UK General Medical Council and Irish Medical Councils since 2009. 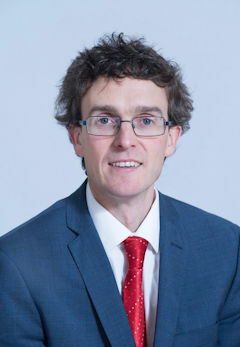 Dr O’Sullivan was appointed Consultant Neurologist in St George’s Hospital NHS Trust, London and also at Frimley Park Hospital NHS Foundation Trust in 2010 before returning as a Consultant Neurologist at Cork University Hospital in 2011 and transferring to Bon Secours Hospital Cork in April 2017. Dr O’Sullivan completed a PhD in clinical neurology in 2010 from University College London. He has published over 120 peer-reviewed papers, numerous other publications, and is the author of four book chapters. Follow his Research publication list to see more. Dr Sean S. O'Sullivan, PhD, MB, BCh, BAO, BMedSci. Trading as Precision Neurology, Unlimited Company. Registered in Dublin. No. 542995. Directors: Sean O'Sullivan and Elaine McMahon.